Today’s dog word of the day is lapdog. You have likely heard this term many times already as other dog owners may have jokingly referred to their large dogs as “lapdogs” to depict their tendency to want to climb into their laps regardless of their size. Today’s term though does not refer to those large dogs who think to be lapdogs, but the lapdogs par excellence, those little dogs which generally had a history of having no particular working purpose (other than providing companionship) and that were quite popular in many societies around the world. Lapdogs aren’t a specific breed of dog, but are simply small dogs that would easily fit on a person’s lap. These dogs were often associated with the wealthy and the aristocrats with ample of leisure time. Many lapdogs weren’t purposely bred to carry out any specific tasks as working and hunting dogs did. The lapdog’s main job was simply providing companionship and warming up the laps and feet of aristocratic ladies in royal households. In some cases, lapdogs were perceived as “fashion accessories” for fashionable women and sometimes even status symbols. There are many portraits by old masters featuring the aristocrats with their small dogs. Many lapdogs featured puppy-like, neotenic traits such as folded ears, large eyes and high foreheads. Still as of today, these traits make us want to pamper them and that’s why many people are so tempted to treat lapdogs as surrogate babies! The great majority of lapdogs boast members of the toy group, petite dogs known to have a friendly disposition. 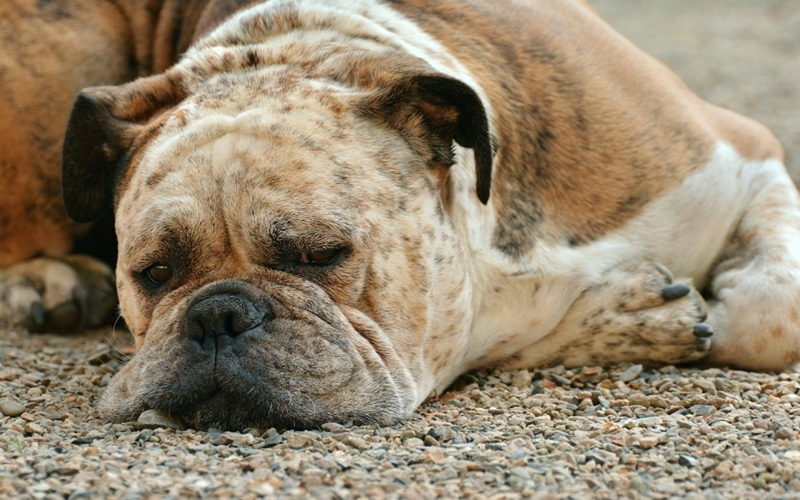 People often think of lapdogs as lazy dogs who would rather prefer lounging on a comfy pillow all day rather than romping outside in the yard or going on a walk. Despite their fluffy, cute looks and reputation as lap warmers, lapdogs have still a need for walks, play time, mental stimulation, socialization and training. It’s important to keep this in mind to prevent behavior problems! Also, due to their small size and fragility, lapdogs may not be the most suitable candidates for families with children. Following are some example of lapdogs known for charming the aristocrats with their appealing looks and delighting their days with their charming antics. Queen Sophie Dorothea of Prussia with a Papillon 1737, by Antoine Pesne. According to the UK’s Papillon Club, there is belief that this breed descended from the European Toy Spaniels. This breed’s name derives from the French word for butterfly courtesy of this breed’s characteristic butterfly-like hair on the ears. 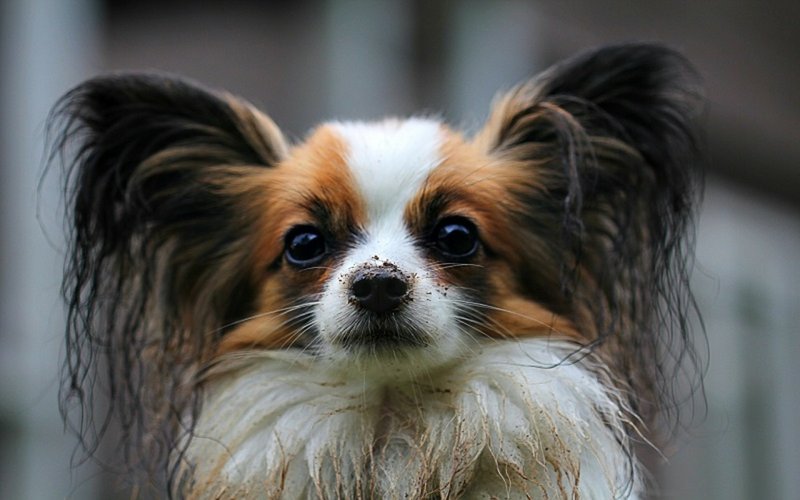 Not all papillon though come with these characteristic ears! The ones who have ears that drop are known as phalene, the French word for moth. Both varieties are accepted by the AKC breed standard and they are judged in the same classes. These pooches were portrayed in many paintings of royal families around Europe as early as the 13th century. There’s belief that the papillon must have been pure for at least 700 years, at least since Renaissance times, according to the United Kennel Club. 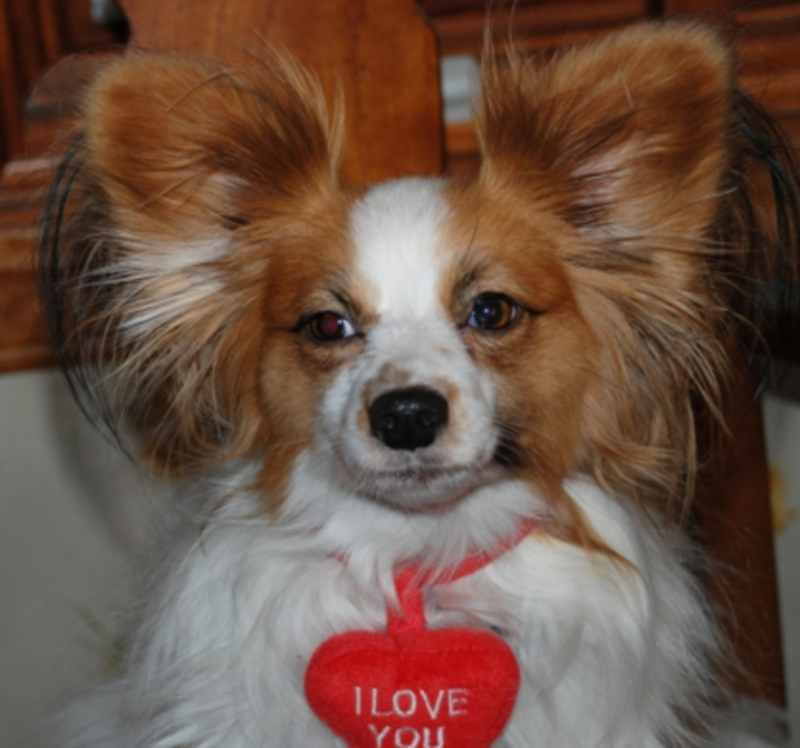 The papillon is therefore considered one of the oldest toys breeds. Back in time, Chinese mythology considered the Pekingese a cross between a lion and a tiny monkey known as the marmoset. According to the Pekingese Club of America, the breed became a passion of the Chinese Emperors and courtiers to the extent that anyone who was caught smuggling one for sale suffered a terrible fate by torture. Only members of the Chinese Imperial Palace were allowed to own one. Interestingly, DNA analysis has established the Pekingese as also one of the oldest dog breeds. Pugs originated in China around 400 AD and were cherished by the Shang Dynasty. Like the Pekingese, these pooches were prized possessions of the emperors of China, so much that they were often guarded by soldiers. They were often found in Buddhist monasteries in Tibet. According to the Pug Club of America, it is thanks to Dutch traders that these dogs were brought from the east all the way to Holland and England. Soon, they become a favorite by many monarchs of Europe. In nineteenth century England, Queen Victoria owned many pugs and her passion was passed down to several other members of the Royal family including her son and grandson. According to the American Kennel Club, Joesphine, wife of Napoleone owned a pug names Fortune. 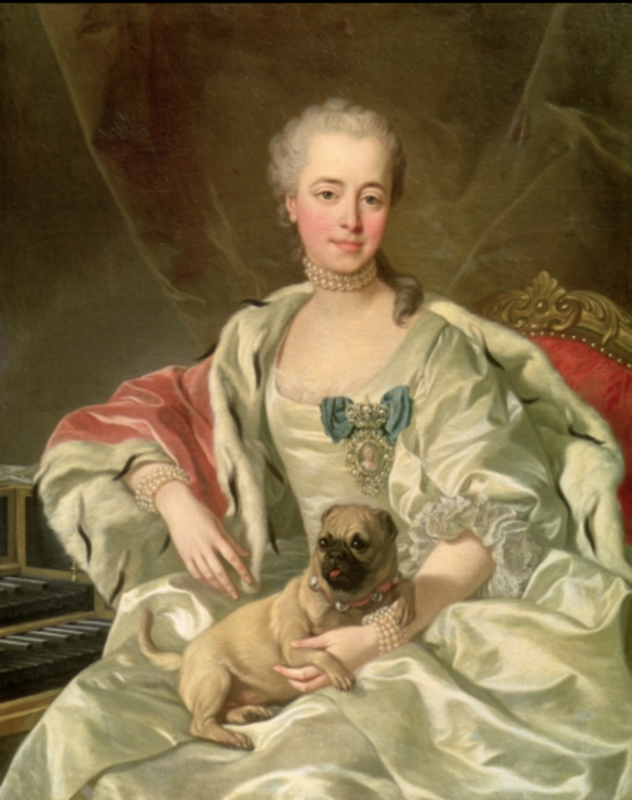 When Napoleon was imprisoned in Les Carmes, she used her pug to carry messages in his collar to him. Pugs are known for charming their owners with their clownish personalities. 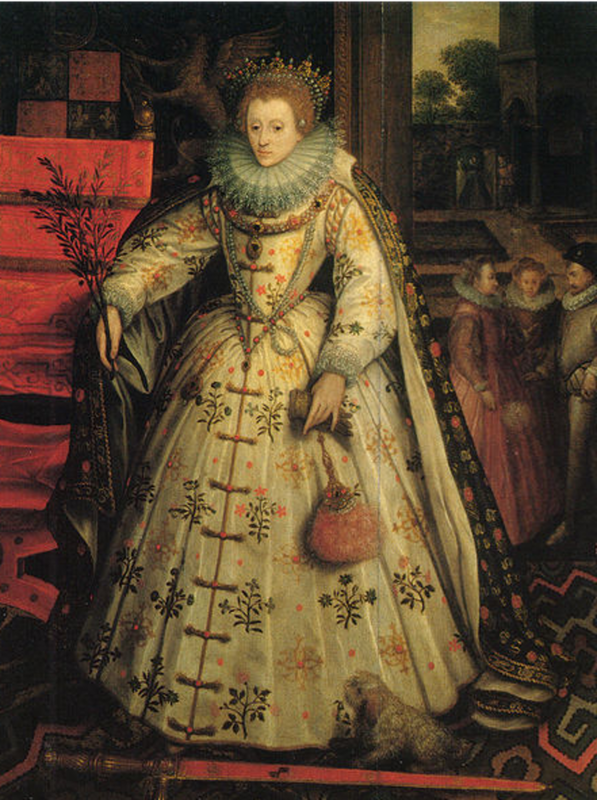 Portrait of Elizabeth I with bichon at her feet. The bichon frise along with the Havanese, Bolognese and Maltese, has been a favorite among the royals and aristocrats for a very long time. The breed became particularly favored in France, Italy and Spain where they were carried around, perfumed and pampered, sometime around the 13th century. According to the American Kennel Club, Henry III of France was particularly fond of this breed and he carried his beloved bichon with him everywhere he went in a little basket. Several portraits attest the great love many royals felt for this small dog. A Renaissance painting by Titian shows Federico Gonzaga, duke of Mantua, with a bichon at his side while Sir Joshua Reynold’s portrait shows a bichon warming up the lap of Miss Beatrix Lister. Bichon are featured in several other important paintings, from famous classic artists, like Sustermans and Goya to the impressionists Renoir and Monet. When bichons weren’t warming up the laps of the aristocrats, they were impressing audiences with their circus tricks and antics. This European toy dog was likely the result of mixing small spaniels with Oriental toy breeds such as the Japanese chin. Also known as comforter spaniels, these precious lapdogs worked well not only as great lap and foot warmers but sometimes also as great surrogate hot water bottles too! We often think of lapdogs as favorite among aristocratic ladies, but men loved them too. As the name implies, this breed gains its name from King Charles I, who was so enamored with this breed that he was sometimes accused of giving more importance to his dogs than to matters of state! After his death, the Duke of Marlborough took over as an advocate of the breed. He was particularly fond of the red and white coat which he called “blenheim” in honor of his estate. This breed continued to appeal to the homes of the wealthy for many generations. A smaller version with a rounder head and flatter nose was produced to cater to those looking for an eye-catching lapdog. These smaller specimens were called by American breeders “English Toy Spaniels“. This breed’s ancestors were the large, Spitz-type working dogs deriving from Arctic regions. It is thanks to two members of the British Royal Family that the breed became popular. In 1767, Queen Charlotte brought along with her two Pomeranians from England. 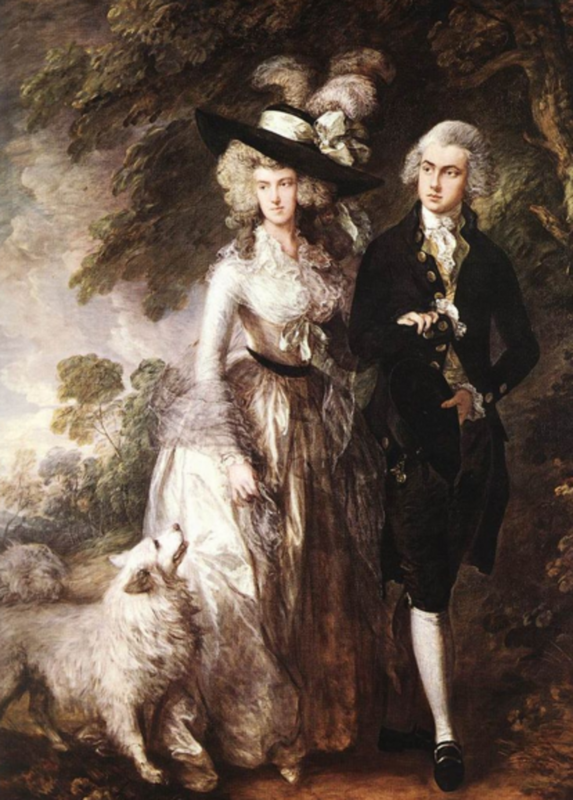 The poms were immortalized in some painting by Sir Thomas Gainsborough. As seen in the painting, back then these dogs were much larger than what they are today, weighing as much as 30 to 50 pounds. Queen Charlotte’s granddaughter, Queen Victoria also became enamored with the breed. She owned a smaller Pomeranian than average and when she exhibited him, more and more breeders were interested in producing smaller specimens. During Queen Victoria’s lifetime, the size of the Pomeranian was reduced by an astounding 50 percent, turning into a popular lapdog. Royal owners include Joséphine de Beauharnais, wife of Napoleon I of France, and King George IV of England. 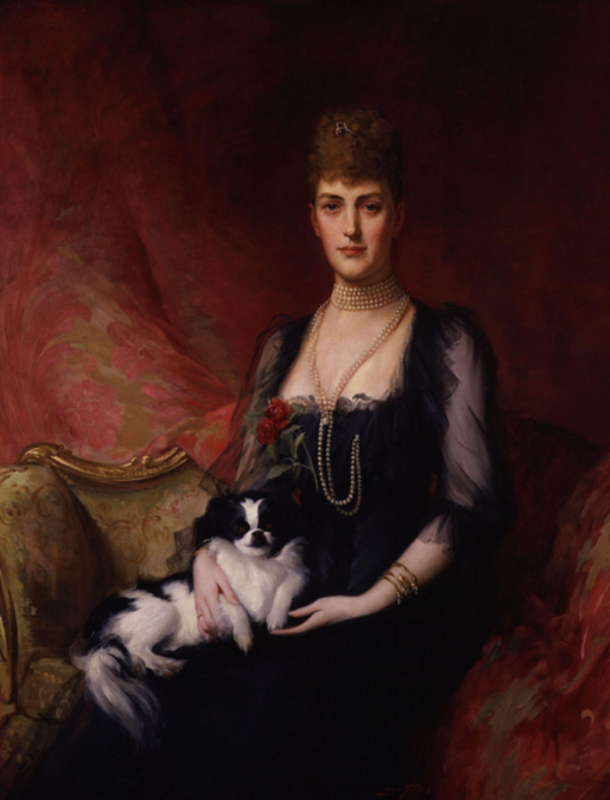 Portrait of Alexandra of Denmark with her Japanese Chin called Punch. The history of the Japanese chin is a bit shrouded in mystery, but one thing is for sure, these dogs captured the hearts of Japanese royalty and, like the Pekingese, their ownership was restricted to the nobles. They say that this breed’s name is a misnomer, as it likely originated in China and arrived in Japan as gifts from the Emperor of China to the royal court. According to the Japanese Chin Club of the UK, these dogs were bred to be small so they could fit in the sleeves of the kimonos of royal ladies. The breed became popular in the West when in 1853 Commodore Matthew imported some specimens into Britain and the United States where they became particularly popular with the noble and wealthy. 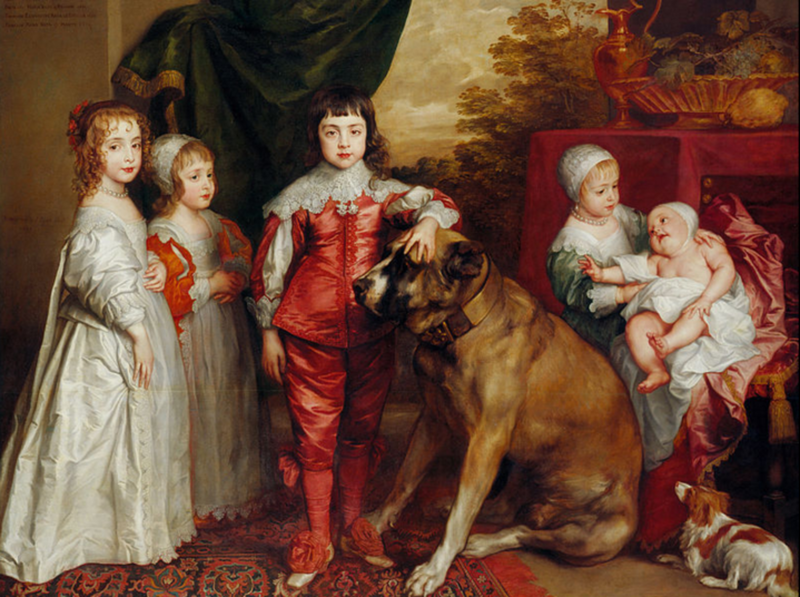 Five children of King Charles I of England (1637) by Anthony van Dyck, featuring a spaniel of the era at the bottom right, public domain.